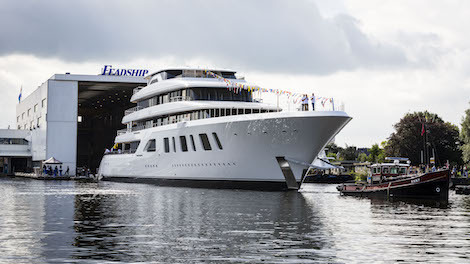 Following a private ceremony at the facility in Aalsmeer, Feadship has launched the highly anticipated 92m motoryacht Aquarius, which has been created in partnership with a very experienced superyacht owner. The fully custom superyacht will now embark on an extensive period of sea trials and final outfitting prior to her delivery, which is scheduled for 2017. With exterior styling by Sinot Exclusive Yacht Design in collaboration with De Voogt Naval Architects, the yacht has an array of recognisable Feadship signature features, such as the conventional bow and raked superstructure shape. The design team was in continuous contact with the owner’s private team in order to ensure the best possible final result. According to Feadship, the client has previously owned 50 and 60 metre yachts, “Having enjoyed his time on yachts from renowned yards, the owner of Aquariusrecognised that the only way to move up to the highest possible standard was to come to Feadship,” comments CEO Henk de Vries. Feadship has claimed that Aquarius is one of the brightest Feadships launched to date due to the large amount of light in the ceilings and in the comprehensive LED system, which is also energy efficient, in combination with the phenomenal amount of glass featured in the superstructure. Aquarius’ propulsion package is essentially a refined version of the conventional Feadship propulsion configuration. The yard is also convinced that the 92m superyacht will prove to be the quietest Feadship to date once sea trials get underway. The 92m will achieve speeds up to 17 knots with a cruising speed of 12 knots. There are currently six yachts, including Aquarius under construction at Feadship, with a combined LOA exceeding 400 metres. According to data collected by the Superyacht Intelligence Agency, there will be a total of six Feadship yachts delivered in 2016.